It has been one of the most fulfilling parts of my life to know that I have helped many thousands of people learn to play banjo, and to improve their musical skills. I was lucky enough as a teenager to have friends who played acoustic music and bluegrass, and my development as a musician happened in that context. Most all of my instruction keeps in mind what's needed when people play music together, and so the skills I teach are ones that will make that activity the most fun and rewarding. 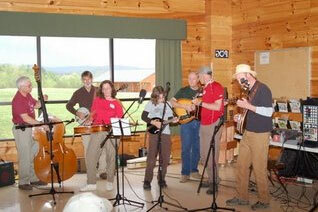 The instructional camps I host all feature a lot of jamming (especially my bluegrass jam camp!). It is a true pleasure to see people who start out as strangers get to know each other while sharing music. It's especially gratifying to see that happen to people who had previously not had the skills or comfort level to be able to jam. At all my camps, everyone is jamming on the first day, even if they never had done it before! With each student, I try to understand his/her accomplishments to date, and musical goals for the near and distant future. With those in mind, and with my knowledge of the learning process, I work with the student to create a realistic and do-able practice program that will yield maximum results in the minimum time. My instructional materials and teaching cover about every part of what I call the ladder of progress, from the very first, introductory, rungs all the way up to when the biggest challenge is how to create a unique style and maintain professional-sounding tone and timing. Regardless of your skill level, you'll find something that fits your needs. A key bit of philosophy I always emphasis is: You can give a person a fish, but it's much better to teach a person to fish. When people use my instructional books and videos, or attend my camps, it's my goal that they understand enough about how they learn so that their practicing and expectations of progress are built on realistic ideas about what works, and how to focus on the most meaningful near-term goals along the path of developing musicianship. In sum, I hope you will find something on this site that will lead you to help in your progress and hopefully achieve that magic breakthrough when "the light goes on". I invite you to e-mail me with questions about whatever music-learning topic is on your mind. Some of the questions and answers will appear in the "Ask Dr. Banjo" section of the site.